I was on a baking frenzy this weekend. Along with making candy, which I will post about tomorrow, I also made about 10 dozen cookies and a pumpkin tiramisu, which is sitting in the freezer for Christmas dinner. I made chocolate chip, peanut butter chocolate chip ( I picked up the wrong bag of chips! 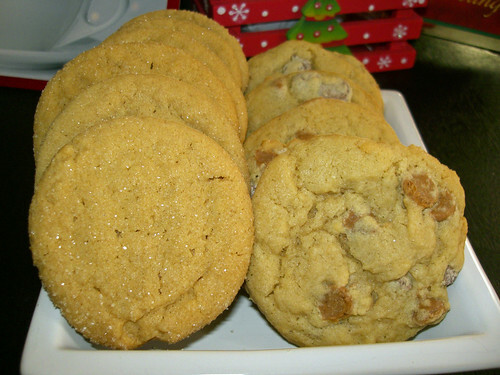 ), and peanut butter cookies. Good thing I like peanut butter! I used the classic Tollhouse Cookie recipe for the chip cookies, which can be found here, and I used this really great peanut butter cookie recipe, which made really nice chewy cookies. I did make some changes with the peanut butter cookie recipe, I substituted the butter flavored shortening for another stick of butter and I rolled the balls in sugar before baking. Paula Deen approves. I was really happy with how they turned out. After all that baking, I had no desire to even try the cookies, so when Sarah came over Saturday I asked her taste test everything and she gave them the thumbs up.